As I Tweeted earlier today, I had an opportunity this morning to provide an overview of Mayo Clinic’s social media activities to another division within our department. One of the things I enjoy about doing presentations like this is that as I update previous versions I can see where we’ve made progress in the intervening time. Coincidentally, a Mayo Clinic colleague — Nancy Jensen — who leads our Public Affairs division in Florida and also is extensively involved in cancer communications nationally, asked me to provide an overview of what Mayo is doing in social media for a discussion board on which she is a member. It’s a group of cancer communications contacts for academic medical centers. She also thought it would be good for them to get a taste of SMUG and some hands-on social media education, so I decided it’s time for another update here. Our Mayo Clinic YouTube channel has been significantly upgraded. We’ve been able to get the look and feel customized to closely match mayoclinic.org, our main Web site for patients, and we’ve added playlists to group some of the similar videos and highlight them. Currently we have featured our Mayo Clinic Medical Edge videos and the video testimonials and personal stories we shot at the Transplant Games with the Flip. We’ve started a Mayo Clinic News Blog. We still have some refinement to do, but it serves at least two good purposes. First, it enables us to provide video and audio resources to journalists on a password-protected, pre-embargo basis, which should help us get more news coverage. Second, when the news embargoes lift, we take off the password protection and make those same resources available to interested members of the general public. And the videos we put there can discuss the research stories in much greater detail than would get into any mainstream media news story, which is a great service to potential patients. Finally, in just the last two weeks (coinciding with the Transplant Games), we established a Mayo Clinic Flickr account. The first application was to make photos available to the participants who visited our booth, but we’ve also created sets for photos of our campuses, and it seems the next move might be to put photos there that accompany our news releases. Nancy also mentioned that it would be good for me to discuss some things a smaller communications unit, perhaps with three or fewer members, could do. It’s easy for people to look at the resources Mayo Clinic has, and think that these tools are just for the bigger players. That would be a mistake; the truth is just the opposite. Here’s why. Social media tools are a great democratizing force. They enable anyone to create content and distribute it worldwide (and also get feedback from users.) Kids can do this in their basements or dorm rooms; as communications professionals we certainly are capable of learning social media. On a related note, the cost of participating in social media is extremely low. Through wordpress.com, you can get a blog with customized look and feel, mapped to a domain or subdomain of your choosing, and with the ability to deliver your podcasts, for $45 to $55 a year. A Flickr account with unlimited bandwidth and storage costs $25 a year. A Facebook page is free, and if you work for a non-profit, so is a YouTube channel. You may need to pay someone to do the blog and YouTube customization if you don’t have that in-house capability, but if you have a corporate Web site those design elements would be fairly easy to match. And you can get a Flip video camera, with tripod, for less than $200. A digital still camera also can be had for that price or less, and you already have computers capable of using these tools. You can learn more about how to use these tools for free. That’s what Social Media University, Global is all about. You can enroll here and then go through step-by-step, hands-on courses in general social media, blogging, podcasting, Facebook and other topics. All it takes is your time. In the end, that’s the real potential cost for social media: it takes some people and a commitment to be involved. But I would submit that these tools provide leverage for you to accomplish your other work, and that by using them you will get better results in less time. And they also provide an opportunity for you to leverage the involvement of others in your organization, outside of your public affairs or communications group. Tell your story! How are you using social media? In the comments below, please share your stories and examples of how you’re using social media in your organization. I’d like to see them, and I know Nancy’s fellow cancer communicators would enjoy them as well. The games haven’t even started yet; today was just the first half-day of registration and setting up our Mayo Clinic booth. I heard some great stories, both from organ recipients and from donor families (as well as some from families in which one member had donated to another) and we uploaded them to the Mayo Clinic YouTube channel. Here’s one that was especially touching for me, because it involved a Dad (about my age, or maybe a bit younger) with five kids (I have six), none of whom had been born when he received his donated kidney. 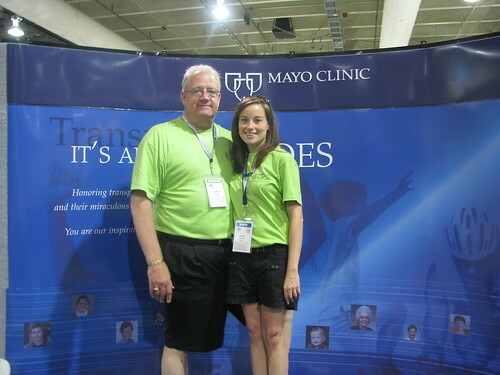 Here’s a photo taken on the medal stand in the Mayo Clinic booth, of Katie Schnell and her father, who was her kidney donor. You also can listen to Kati tell her story on YouTube. There were lots of other moving and inspirational stories, and you can see them by clicking here (more will be uploaded soon) or by searching for transplantgames08 on YouTube. More videos will be shot and uploaded tomorrow, and I hope others who are staying for the entire games will shoot videos, and upload photos, and write blog posts giving them the transplantgames08 tag, so we can see and hear more about the difference transplant can make. Kay Kosberg and Kristin Eggebraaten are two representatives from the Mayo Clinic Transplant Center who are staffing the Mayo Clinic booth this weekend at the U.S. Transplant Games in Pittsburgh. 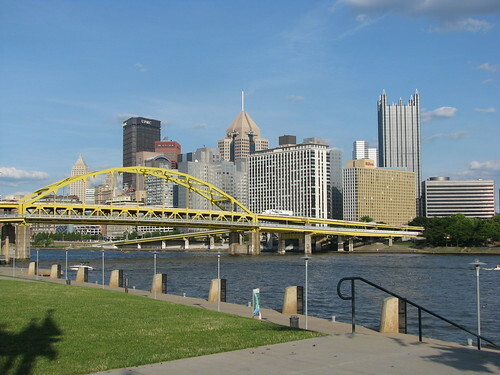 Here’s a photo of the Pittsburgh skyline they took yesterday when they arrived, and we uploaded it to the Mayo Clinic Flickr account. Update: Here’s a photo of the three of us staffing the booth, taken just before I left last night (they’re on the medal stand, and I’m on the floor). Kay and Kristin are taking care of the booth today. I’m sorry I won’t get to see the opening ceremonies. 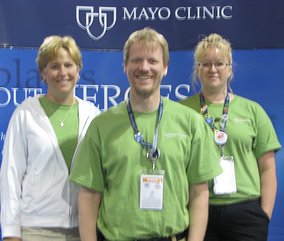 I am accompanying a couple of staff members from the Mayo Clinic Transplant Center in our Mayo Clinic booth. They’re the experts in transplant and medicine, and I’m helping them work with the transplant recipients, living donors and their family members who are here to promote organ and tissue donation through social media. Here’s a description of what we’ll be doing. More than any type of patient I know, transplant recipients seem to be especially grateful for the opportunity at a new life they have been given through transplant. Whereas some patients may want to keep the fact of their medical conditions private (which is absolutely their right), my experience with transplant patients is that they have an evangelical zeal to let people know how important organ and tissue donation is.